The era of technological advancement is at its growth stage, along with increasing number of devices like smartphones, laptops, security appliances etc…etc., the number of Internet of Things devices are increasing at faster pace. If you look at Intel Internet of Things earning of past year 2014 then you will be able to see the growth opportunity of Internet of Things market, Intel have made a revenue of $2 Billion around in past year and is expected to grow in present year. 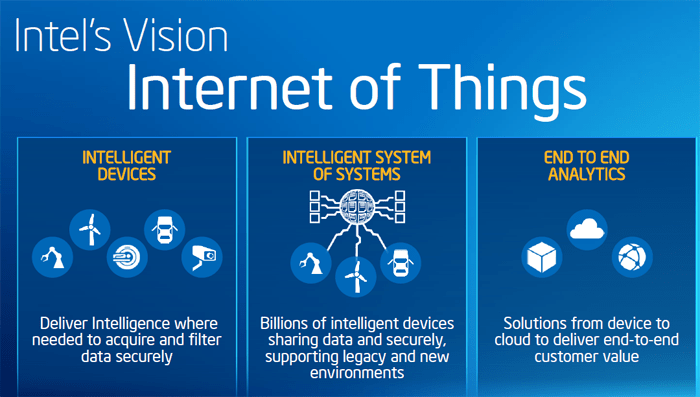 Intel Internet of Things offers its platform in various sectors like Industrial, Agriculture, Building Smart Cities, communication with major tie-ups with INOX Communication, Jabil Inc., Jaguar Land Rover. Intel also made announcement for the launch of new Intel Pentium, Intel Atom Processors & Intel Celeron. These offer high end graphics in a low thermal envelope and these processors are exemplary for Internet of Things devices in consumer market. Intel recently upgraded its gateway reference design that propounds option in silicon and software with additional Intel core processor based gateways and as mentioned earlier Wind River Intelligent Device Platform XT3 with supple packaging options for various applications that are available at lower entry cost. 5th Generation Intel® Core™ Processors with Mobile Intel® QM87 and HM86 Chipsets – This Chipset is designed to deliver high end graphics and CPU performance leading IoT innovation at same time keeping compatibility with previous generations resulting in enhancement of user experience with their devices in terms of high security, high end graphics, power efficiency & flexibility. Multiple partitions can be used on a single computing device to concurrently run both general purpose and real time operating systems. Harness development tools to utilize pre-configured partitions as per suitability for the applications. Install less number of sub-systems for reducing complexity, foot print & energy usage. As there are lower number of devices to manage hence there is lower integration & operating cost. Smart Home Gateways (SPD/OIC) – Intel has launched its software named Puma6 Smart Home Gateway that enables the home sensors, appliances and other system get connected to the could smartly. This enables the cloud to act as central hum of intelligent computer services for the smart home. Smart City: Wind River – Intel have extended their smart home concept a step ahead with creation of smart city. Wind River Helix provides a platform for end-to-end Internet of Things solution that enables users to get connect high end devices and other machines to the cloud covering smart city. Smart city is laced with intelligent infrastructure that results in higher reliability, efficiency and security with cloud based intelligence. Intel Internet of Things: Developer Kit – The Intel IoT Developer kit facilitates a powerful readymade hardware and software platform that is versatile & capable of optimizing performance and provides end-to-end IoT solutions that is supported on various tools, security, cloud connectivity and hardware like Intel Edison, Galileo, Gateway solutions etc. Automotive Intel IoT is helping significantly in digitalization of automotive industry. 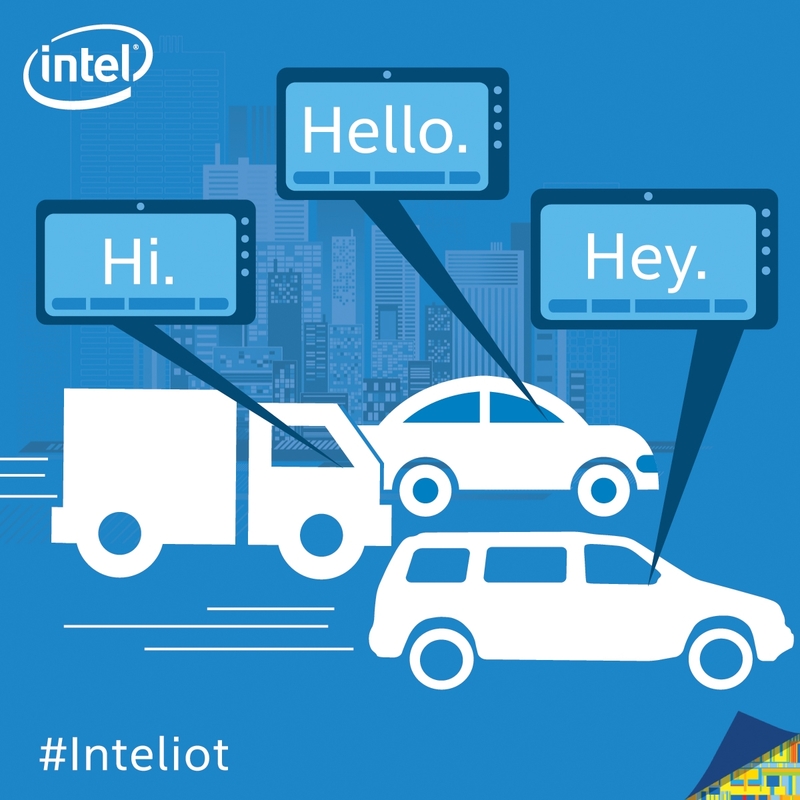 Intel technology is used in cars that you drive to enhance your experience, as when your car is laced with Intel Internet of Things then there is free flow of information between the device (car) and a=internet resulting into actionable insight both in surround environment and inside the car. Brands like Hyundai (Hyundai Genesis), BMW (like BMW I Series), Kia, Infiniti are using Intel Internet of things in their car to enhance experience of their customer. If we talk about the recent launch of Hyundai Genesis then the car offers you features like High Definition Screen, optimized response time when you interact with system and much more. Intel – When it comes to power supply, Intel in collaboration with McAfee and Wind River to facilitated hardware & software solutions that can easily integrate with current energy IT grid and can turn data into knowledge I.e. it will ensure the security, reliability & end to end connectivity in power distribution and consumption. Intel Healthcare Internet of Things is also working to keep you safe and healthy by catering Hospitals with IoT technology that helps monitoring of patient more convenient and helps in offering you personalized treatment that means your health is given importance and when you visit any hospital this technology ensures a better result for treatment catered to you. Business hold sensitive data that can affect their business operations significantly if such data get in hands of competitors, hence one of major issue for all business is to get their business information safe and secure from any theft or virus attacks. 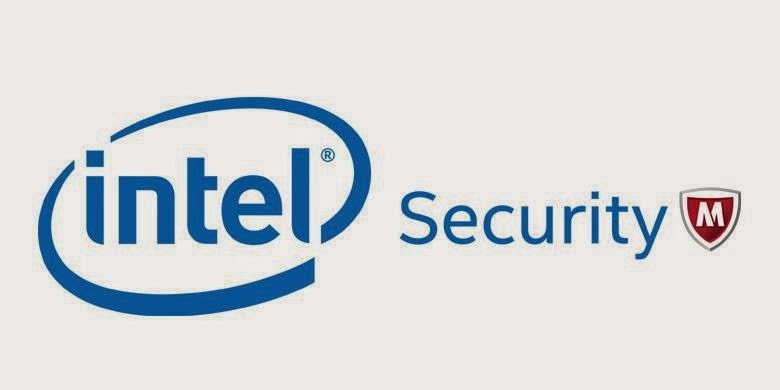 Intel Internet of Things – Intel has joined hands with McAfee and has come up with security solutions for protecting business information from any theft and phishing attacks. McAfee Embedded Control is a security software that helps you to secure your data by automatically generating whitelist of “Authorised Code” on the system for security. 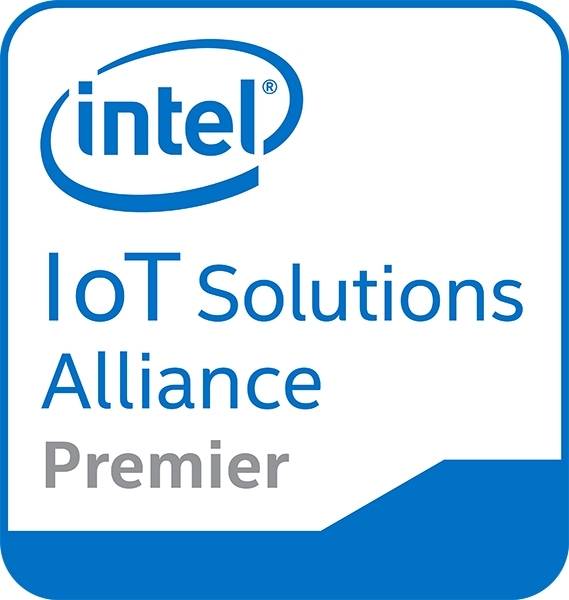 Intel IPT – Intel Identity Protection Technology is another security solution the prevents intruders to access data stored in the cloud by using powerful hardware based authentication and validates that a user is logged in from a trusted device. The fundamental base of Internet of things is to get your daily use devices connected to the cloud. Using this technology you can easily get your daily use device at home (like security system, door sensors, light sensors and so on) or at your business (like Plant and machinery, data storage and analysis, Retail & Logistics etc.) to get connected to cloud and give allow you centralized management & control. Intel XMM Platforms – Its design is based on slim modem that supports 2G, 3G and LTE which enables high speed data & voice. Intel Active System Console – This is an open source console for operating system platforms like Microsoft Windows, Red Hat Linux and SUSE Linux. Once you install this console on your device it will show a dashboard view of the device. SAS Hardware Raid Driver – This driver is for Windows operating system with HA-DAS (High Availability Direct Attached Storage Solution) is included in SAS hardware RAID driver. Intel Internet of Things is catering our need with diversified products and services that are helping us to get our daily task done with more ease and less complexity (via digitalization). These solutions are helping you to boost the productivity with increased security, reliability with centralized management and control at same time. Connect with us on social media or join our online IoT forum & email newsletter to stay updated in Internet of Things. We also offer monthly giveaways to our email subscribers.